Man, I don’t even need to write captions for these caps–they’re perfect on their own. The next morning, Emilia quickly leaves Maou’s apartment before Maou and Ashiya awake. At work, Emilia gets a strange phone call by someone who she immediately recognizes as a Demon. But who? Later on, Emilia is called in by police to help bail out Maou. He got taken in because of the bike he left behind after the two were shot at with magic bullets. Before she leaves Maou and Ashiya, she warns Maou that someone is definitely after them. After the police fiasco, Ashiya takes Maou clothes shopping. It’s almost time for his meet-up with Chiho. Chiho sees this meet-up as a date, though Maou doesn’t seem to really care either way. The two end up going to a café located in an underground mall. While Ashiya spies on Maou and Chiho, he ends up meeting with Emilia, who is walking home from work. Emilia is less than pleased to see that Maou’s “dating,” thinking that Maou may have some evil intentions towards the human girl. Of course Ashiya would be the more fashion-conscious one. Of course. Chiho tells Maou about the strange voice she’s been hearing. 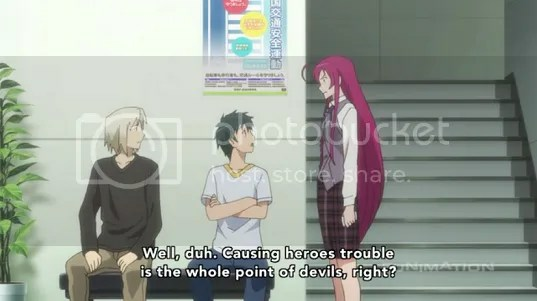 This was the initial reason why she called Maou out. Because of the mysterious voice, she was able to predict an earthquake. And there have been an awful lot of them lately. Chiho then begins to confess her love to Maou, but Emilia confronts the two. 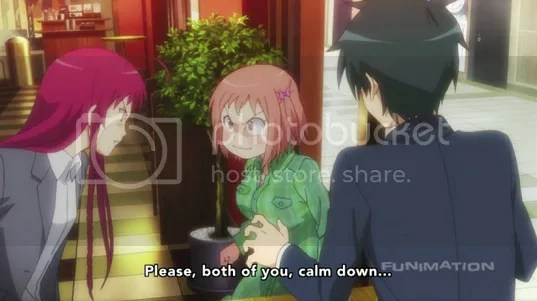 Chiho mistakenly believes that Emilia is Maou’s ex-girlfriend, and an argument between the two women ensues. But suddenly, another earthquake hits, causing the underground mall to collapse. Thanks to Maou, who has suddenly regained some of his lost magic, the people trapped underground are able to be rescued safely and there are no casualties. After everyone is rescued from the collapsed mall, Emilia finds herself feeling lost. 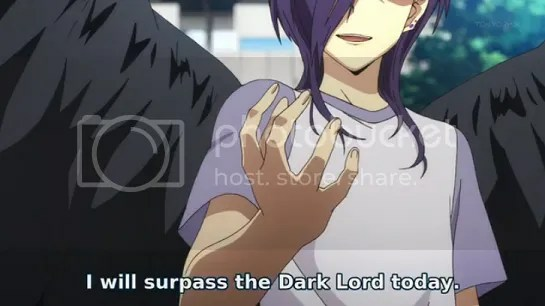 Why is the Dark Lord being so kind? Especially when he was so vicious and cruel back on Ente Isla? Emilia has a brief flashback of her previous life on Ente Isla. She ended up being taken away from her father by the Holy Church, because only she was able to wield the holy powers needed to bring down Satan. Back in the present, Maou finds out that Chiho is the daughter of the police officer whom he hypnotized when he first came to Tokyo. 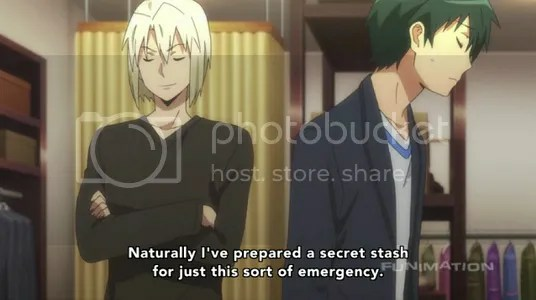 He suspects that it’s his involvement that allowed Chiho to be able to hear the “mysterious voice.” While Maou and Ashiya head back to their dingy apartment, Emilia ends up spending the night at a co-worker’s place. While at her co-worker’s place, Emilia is given a lot of time to ruminate over recent events. Has Maou really changed from his evil ways? The next day, Emilia comes by to Maou’s apartment to pay him back the money he lent her. As she’s leaving, she accidentally trips and falls down the stairs; and thus has to go back to Maou’s place to get bandaged. After Ashiya goes out to buy more first aid stuff, Emilia lets out all her anger on Maou, and says that she can never forgive him for what he did to her life. Emilia and Maou’s conversation is interrupted by the appearance of Chiho, who misunderstands the situation and ends up running away crying. Soon after, Maou’s landlady drops by, and reveals that she knows much more about the trio than she initially let on. Afterwards, yet another strong earthquake hits. As Chiho is running away from Maou’s place, she ends up bumping into a mysterious black-haired boy, who reveals his magical powers and destroys some buildings. Maou, Ashiya, and Emilia run towards the destruction, and we’re formally introduced to the mysterious boy. Turns out that it’s Lucifer, one of Maou’s former generals. So now we finally have a true “antagonist” to the story. Even though I honestly would have been perfectly fine with this being a wacky slice-of-life series starring a former dark lord, it’s still nice to see that this series has much more going for it than just that. Although I disliked her initially, Chiho really grew on me. Sure, she’s still a bit annoying at times, but the way her character is written, I also find her strangely endearing. Of the main characters, Maou and Emilia are also getting fleshed out nicely. So far, though; it almost seems as if Emilia is getting most of the spotlight in recent episodes. Which I’m fine with. As much as I love Maou, Emilia seems like the more complex character. I really loved her introspective scenes in episode 4. Unfortunately, that means that Ashiya has now been resigned to being the comic relief of the series. I really hope he gets some more screentime/character development eventually too. 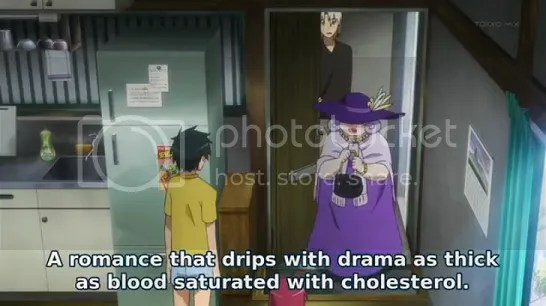 Plot-wise, Hataraku Maou-sama is moving at a fairly fast pace. 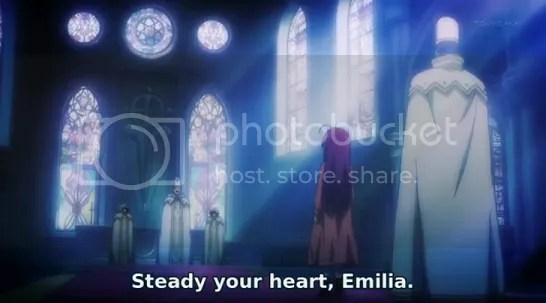 With the appearance of Lucifer, and the knowledge that some of Emilia’s allies are on their way to the modern world, things are going to get pretty serious from here on out. But probably not too serious since, after all, this is still a comedy series. And hey! We finally get an official opening, and a new ending theme! The opening theme is just re-used footage from the first two episodes, so it felt kind of cheap. And the new ending theme is just… one long scrolling image of Chiho in swimwear. So it also feels kind of cheap. But whatever. The animation for Hataraku Maou-sama isn’t amazing, but it’s still fairly good. As long as the animation within the episode stays consistent, I’m happy. Overall, these were two great, solid episodes. Not much to criticize here. If you’re keeping up with this series, then you obviously already like it. Annnnd he’s voiced by Keima (of TWGOK fame) too. 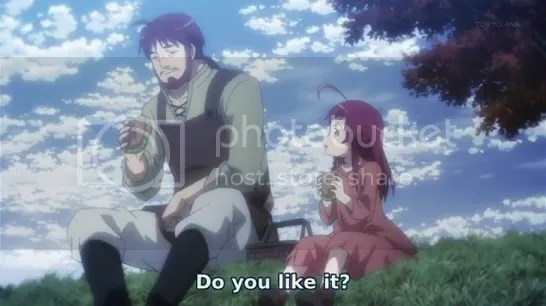 I was expecting Hataraku Maou-sama to lead to Maou and Emilia adjusting to the modern world and getting closer, but seeing some of their old comrades/enemies appear actually makes it more interesting. The landlady was the biggest surprise for me, I would never have guessed that she knew anything about magic or even who Maou was. Now I’m actually interested in knowing who she is exactly.